For a while now, cupcakes has been the new food fad. 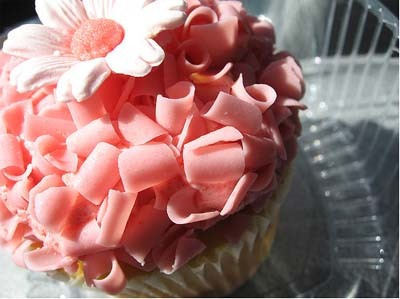 Specialty shops in New York and Los Angeles create elaborate cupcakes that are more a work of art than a treat. The cupcake fad hasn’t hit Salt Lake City yet. I’m sure in a year or two, it will be the “new” thing to hit our town and all the local bakeries will start specializing in designer cupcakes. Part of me is torn when I see beautiful food like this. It’s so pretty and all the food weblogs are talking about “amazing” cupcakes from Bristol Farms. It makes me feel left out in a way. People are experiencing something that I would have to travel to just see. I want to eat this pink cupcake just because I can’t eat this pink cupcake. This has nothing to do with sustenance and EVERYTHING to do with hunger. My desire for this cupcake isn’t about a tasty treat. It’s about wanting to fit in. It’s about wanting to be cool. It’s about getting what is denied me. How much of eating is about feeding my body? I’m beginning to learn that I eat for almost every reason EXCEPT to feed my body. Previous: How Do You Comfort Yourself Without Food? I want ice cream now that it’s harder to get. I lost a lot of weight on cupcakes. I made them lighter and kept leftovers unfrosted in the freezer. Portion control has always been an issue. To me a cake is one serving. I’d make full fat icing for hubby. I’d eat it plain or use cool whip and pudding mix for icing. Have you ever been to Backer’s Bakery on North Temple in SLC? That’s where the designer cupcakes are! They’re just about as beatiful as your pink cupcake above, but they’ve been around since my mom was a kid in the 50s. Give them a try! what do you suppose the pink curly stuff is? The pink stuff is white chocolate dyed with pink food colouring. Actully the pink “curly stuff” as you called isn’t just white chocolate dyed pink, its strawberry chocolate curls. Its very commonly use in cake decorating now adays, you can also get banana ( yellow curly stuff), mint (greeb curly stuff) red (cherry curly stuff) among other common flavours. Ok. So where can a person get these wonderful flavored curls from? Almost everything has an element of “cool” to it, whether it’s which shoes we buy, how we cut our hair, or what style of clothes we wear. Yes, cupcakes are a trend right now (ironically found your blog by searching for a cupcake pic!) and yes they are great, but it sounds like you don’t really want to eat one- you just want the ability to eat one. It’s kind of like looking at a luxury item in a store. Most of us can’t afford a $900 purse, but I bet a lot of us would like to be able to! Would we buy it? Who knows! The point is that it’s about ability. I think a great way to move past this cupcake thing would be to invite some friends over and make some yourself. If you really want them, they’ll taste great and be even more fun because you’ve made and decorated them with your buddies. If not, guess you didn’t want that cupcake that badly after all!! 🙂 Hope this helps! p.s. my blog is similar to this- you might want to check out my post on emotions and eating. It covers a bit of this….